Dana, a Russian-American citizen, was found guilty for “abduction” and “extortion” last week in a Kansas federal court. In two months she will be sentenced to up to 43 years in prison. Dana has two months to decide whether to sit in prison for 43 years or agree to her children being given to their violent, abusive father. Dana has already been in prison for nearly two years, ever since she returned from Russia without her children, believing there would be a fair hearing on her case in Family Court, but instead, she was arrested and incarcerated by the feds. Dana was not given a fair criminal trial. The judge did not allow the jury to hear her affirmative defense: the evidence of the father’s violence she left behind. He permitted the belated addition of two bogus extortion charges, increasing the sentencing range from 3 to 43 years. This was obviously done to increase the pressure exponentially on Dana to agree to give custody of her children to their abusive father. And jury selection was rigged, with only 3 women chosen. Normally it is the county D.A. who colludes with family court judges and criminally punishes women for daring to challenge male authority in the family by leaving with children. But this case is in federal court, since it is an international case. The fact that even federal officials collude with family court judges to punish errant women is further proof that the cause of the crisis is entrenched paternal entitlement, which is enforced by all systems relating to custody of children. Dana, a Russian-American living in Kansas, had fled to Russia in 2014 with her older son from a previous marriage and her baby daughter. She was also pregnant with her second child by her abusive husband when she ran. Dana immediately filed for divorce in Russia and was granted sole custody of her children, but her ex was also granted sole custody in Kansas. Dana and her children were safe and happy in Russia, but she was tricked into returning to the U.S. in 2017. Dana was told that if she returned, she would be afforded a fair hearing, but instead she was arrested and incarcerated. Dana has reportedly been subjected to torturous treatment in prison including being forcibly medicated with anti-psychotic drugs, which made her very ill. This terrible treatment was apparently done as part of a ploy to get her to break and agree to her children returning from Russia and given to her ex. Dana has not broken yet, but 43 years is a long time to be wrongly imprisoned. The irony is that she is being imprisoned for extortion, when she is the one being extorted for her children. Please comment in support of Dana. TWC NOTE: Women must wake up to the reality that men still control us through our children and must demand a new system in which the old boys, and those who do their bidding, do not have the power to take our children. The "Child Custody Act" codes for a new system in which children’s physical and emotional well-being is ensured. NOTE: This case has gotten media attention both in Kansas and Russia, but, as usual, they have left out the facts that show why Dana left. So they will not be linked to here. A Crushing 96% of Moms Say Judge Deliberately Harmed Their Children. In a Women's Coalition poll, 96% of over 300 mothers say their Family Court judge did not make an honest mistake, but that s/he knew her/his rulings were not good for the children, and in many cases, very harmful, as is evidenced by comments on the post. This result is consistent with the thousands of emails The Women’s Coalition has received detailing how judges have disregarded, and often actively concealed, considerable evidence of abuse or unfitness by the fathers of their children. These poll results are important because they confirm the core cause of the custody crisis is judges DELIBERATELY disregarding children’s safety and well-being in order to grant custody or unsupervised visitation to fathers, many of whom are physically or sexually abusive. That means the solutions being pushed by protective parent and child abuse organizations will not make any significant difference in the crisis. Since judges are DELIBERATELY ignoring evidence and falsely finding mothers to be lying, alienating, abusive and mentally ill, no amount of training, resources or new laws will help. It doesn’t matter how much the court parasites profit off custody cases or how much money fathers or mothers have, the result is the same. And it doesn’t matter what new laws are enacted, because family court judges can violate laws with impunity. Family courts are designed so judges have, in effect, absolute power. "Family Court" is just a modern-day mechanism used to enforce male entitlement, power and control in the family. Patriarchy means literally: “rule of the father”. It is no coincidence Family Court judges have been given nearly absolute power. It's so they can maintain fathers’ control over "their" women and children after divorce. The only way to end the crisis is to eliminate this root cause. That means a new system must be implemented, in which juries, not judges, have the power to decide custody, which operates in a REAL civil court, not the rigged Family Court system, and which eliminates all the tactics currently used to grant custody and unsupervised visitation to undeserving fathers. Since male power in the family is arguably the most coveted patriarchal perk, and paternal entitlement is systemically entrenched, WOMEN MUST UNITE as a class, as half the population (along with men who truly care about what is best for children) and demand a new system. 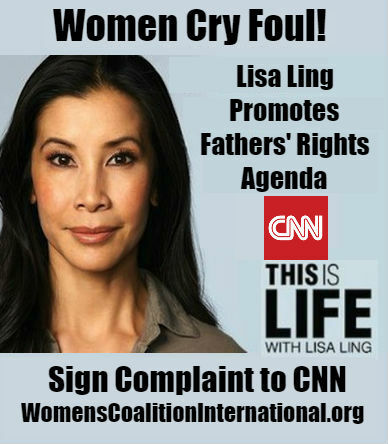 If you would like to help with educating moms and the public about the Child Custody Act or lobbying legislators for it, please contact WomensCoalitionIntl@gmail.com. *If you appreciate the work of the Women's Coalition, please consider donating on Facebook or on Paypal.